This was hard to score, for there were hardly any uncompetitive rounds, but suffice it to say that Trout walked away a winner in defeat as he gave young talent Jermall Charlo (24-0, 18 KO) all he could handle. Charlo was the bigger of the two and did not effectively impose his size and power on Trout. Generally moving forward due to the effect of his size advantage, Charlo elected to be patient with Austin Trout (30-3, 17 KO), matching him punch for punch, e.g., countering Trout's left hand with a left hook. And so Trout was able to breath, as it were, and never became overwhelmed. In fact, Trout was surprisingly aggressive and authoritative with his full assortment of strikes. Not known for his power, Trout's punches were quick and snappy rather than heavy. On the other hand, Trout really preferred to land his jab and straight left hand, which more suited a long range strategy, against a taller and longer opponent in Charlo. Trout appeared to have favorable hand speed, but he was not quick enough with his feet to be elusive. But to re-emphasize the point above, Charlo could have pulled away with more activity because Trout did not have the foot speed to consistently get inside his punches and preferred to create space himself to land his left hands. Charlo out landed Trout 130 to 117 in total punches meaning that they landed a similar number of punches per round. Trout was understandably angry that he did not get the decision – scorecards were 115-113, 116-112 x2 unanimously for Charlo. Julian Williams (22-0-1, 14 KO) is now the mandatory IBF challenger for Jermall Charlo and desires to fight Charlo by the end of the year. This was hard to score, for there were hardly any uncompetitive rounds, but suffice it to say that Trout walked away a winner in defeat as he gave young talent Jermall Charlo (24-0, 18 KO) all he could handle. 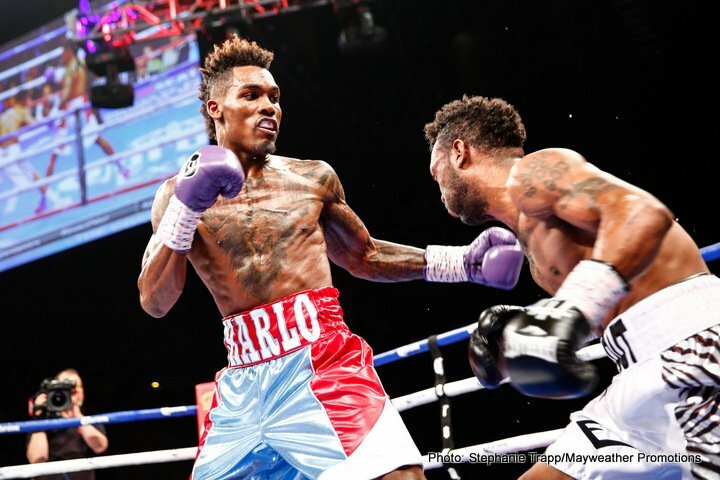 Charlo was the bigger of the two and did not effectively impose his size and power on Trout. Generally moving forward due to the effect of his size advantage, Charlo elected to be patient with Austin Trout (30-3, 17 KO), matching him punch for punch, e.g., countering Trout's left hand with a left hook. And so Trout was able to breath, as it were, and never became overwhelmed. In fact, Trout was surprisingly aggressive and authoritative with his full assortment of strikes. Not known for his power, Trout's punches were quick and snappy rather than heavy. On the other hand, Trout really preferred to land his jab and straight left hand, which more suited a long range strategy, against a taller and longer opponent in Charlo. Trout appeared to have favorable hand speed, but he was not quick enough with his feet to be elusive. But to re-emphasize the point above, Charlo could have pulled away with more activity because Trout did not have the foot speed to consistently get inside his punches and preferred to create space himself to land his left hands. Charlo out landed Trout 130 to 117 in total punches meaning that they landed a similar number of punches per round. Trout was understandably angry that he did not get the decision – scorecards were 115-113, 116-112 x2 unanimously for Charlo. Julian Williams (22-0-1, 14 KO) is now the mandatory IBF challenger for Jermall Charlo and desires to fight Charlo by the end of the year.